visit us for a first-class remedy! With the increased popularity of mobile devices, calendar sales across the board for all publishers have severely dwindled over the past decade. Likewise our sales have decreased accordingly. This year we lost our last major retail outlet; therefore, after 22 years, we are sorry to say we have no other choice but remove the calendars from our product offering. Don't miss our Gift Line of restored nautial antiques! 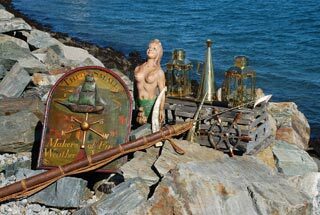 We have collected a unique cadre of nautical antiques (50 years or older)... all have been painstakingly restored to near original condition. These items are perfect gifts for even the most discriminating nautical collector. Our selection changes on a daily basis as items are sold and new collectibles are added. Any item ordered will be insured and shipped via UPS. Satisfaction is 100% guaranteed... if you are not satisfied for any reason simply return within seven days for a full refund. Developed for all recreational boaters, whether Power or Sail, to keep you out of "the school of hard rocks" and as seaworthy as your boat! 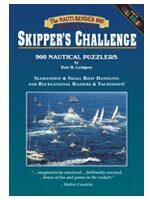 This 320-page book offers, in a fun, game-like format, over 900 of the most practicable and best-liked "Nauti-Benders" and graphics selected from past editions of our popular page-per-day boater's calendar. Read what Walter Cronkite thought of Skipper's Challenge. 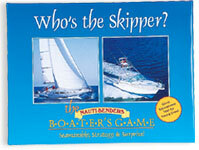 Be at the helm without going to sea...whether it's a boating day or not... with this great Boater's game! This "ultimate Nauti-Bender" was designed to be a terrific party tool by enabling players of mixed abilities to compete and have fun at the same time. But, keep a sharp lookout for those beguiling "Murphy" cards that may turn the saltiest "Skipper" into a "Galley Slave"! A great learning tool for young crew! 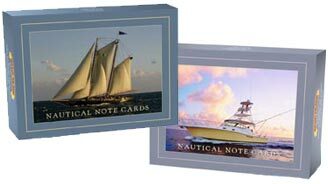 Two sets of limited-edition note cards for Sail or Powerboat Enthusiasts. These high quality, 5" x 7" blank cards are perfect to mark a special occasion with your own unique message. Each set is packaged in an attractive gift box.